This special fan edition of ONe-On-1 features Youtube sensation Dylan Holland! At only 16-years-old, Dylan has already made a name for himself as an internet celebrity, and has established quite a fan base. He sings, he raps, he plays the guitar and he's also a Humanitarian. "Read More" to check out my interview with Dylan Holland! Dylan! I can't tell you how excited I am to have you! It's great to meet you, thanks for coming through! Yeah! I’m really excited to talk to you! Very good to meet you! My man! So as you know, this is my first "Fan Edition" of ONe-On-1 and I have to tell you, your fans campaigned hard for you! I've got to give a special shoutout to Cierra Gannen for sending me your youtube link. I'm so glad I checked out your music, because you're just as awesome as she told me you were! So of course it‘s only fair to include them in this, I have a couple of questions from your fans at the end of this interview! So for starters, what are you working on right now? Do you have an album in the works? Cool! Be on the lookout for that everybody! I’m sure It’ll be really good, I love eclectic albums! It keeps you interested! So, I assume that your life can get a bit crazy, how do you balance everything out? I mean with school, recreation and music you must not have a lot of time? That’s actually one of the hardest things to do. I absolutely LOVE hanging out with people on weekends. It's always been a favorite, I mean who doesn't right? I’m also big on baseball and I have a game every day of the week until May, so that's really hard too. I would love to have a career in music more than anything. So, on some weekends I sacrifice the times that I have with my friends to either write or produce music or talk to my fans. I really do give up a lot and that's hard, but its worth it if it means making all of these people happy. I guess I’m just afraid of missing out on big childhood things while I’m still a normal kid. Yeah, I understand that. I’m sure it’s tough, but It’s totally worth it right? A lot of kids would love to have a huge following like you. In your opinion, at what point can you sit back and say “I’ve made it”. Is it having fans? Selling out concerts? At what point would you consider yourself to be successful? Well, I mean, I already consider myself successful because everyday I get to make someone happy. Everyday that I do that makes me feel more successful. Hearing how happy someone gets when I surprise them with a phone call, or a skype call makes my week! That’s awesome! I have to admit, I didn’t expect that answer lol. I thought you would say success was getting rich or famous, you’re a humble kid I like that. So, how do you feel about how fast you became popular and how did you market yourself? Hmmmm....Well I think that it’s pretty amazing! I never would of thought in a million years that I would have so many people looking up to me. It makes me feel like an important person! And I would never ask for more. My good friend Brandon Utley helped me a lot with my marketing. He sent my music to iTunes and around the world basically. He's a great friend. I’ll say! He obviously sees your potential. It’s always nice to have close friends and family that support you. Now as far as life and music go, who are some of your biggest influences? I would have to say two of my biggest influences are Garth Brooks and my Dad. The reason being because when I was just a little baby, or toddler...which ever, my dad would always play guitar and sing for me. Most of the time it was Garth Brooks. I’m not a huge fan of country music, but Garth is one of the most talented artists I have ever heard in my life. I am also inspired by Michael Jackson, Brian Mcknight, Boyz II Men, 2pac, Eminem, Justin Bieber, and Blessed Union Of Souls. It’s cool that you like so many different genres, and that your Dad is a big influence in your life. I imagine you can get a bit carried away sometimes when you have fans at a young age... so you need someone to deflate your head a little bit if you get to that point, lol! Speaking of that, what keeps you grounded? I think its more of who, haha! My mom and Dad for sure are a big part in that. They're always on me about picking up after myself and cleaning my room. Honestly, I am very messy, lol! I have a hard time remembering things too which is always a problem. My really good friends keep me grounded as well. They tell me when I start to get a big head or a little too full of myself. I love them. Haha! You have to have that solid foundation, we all get big-headed sometimes. So Dylan, I noticed in one of your videos that you were talking about an Animal Foundation I believe? I hear you are involved in a lot of charities, if so, Which ones are you a part of? Well at the moment I have a group on twitter called The Deezy Army, and what they do is for every follower that they get, they donate I think either one dollar or fifty cents to the ASPCA, which is an animal cruelty awareness charity that I think is amazing. I love animals and helping people so I would work with pretty much anything that came my way. Awesome! Shout out to Deezy Army! Everybody follow them on Twitter (@DeezyArmy), they contacted me about you as well Dylan! Let’s talk about some of today’s issues. Personally, I think there are a lot of areas in our society that need work. What changes would you like to see take place in society over your lifetime? Haha! Well “Deezy” I definitely agree with you on that! Changing the way we treat each other, alone, can move mountains. So, being that you‘re so involved and active in your community, I guess it would be important to you to treat others well... Do you think it‘s important for all young people to get involved in their community? It’s so important! More than people realize. When you do something for your community, It not only shows how much you care, but how responsible you are to take up for the place where you live. Very “Tru” Dylan, I had to use the play on words here, lol. Alright, this is my last question for you and then we’ll get into some of your fans questions. Do you believe in God? YES! I do believe in God. I used to go to church every Sunday for about a year and then I got really big into my music and baseball and that slowly faded. I pray every night before I go to sleep. HE really is great. If HE's not in your life, you should invite him. Beautiful! You’re absolutely right! So Dylan, I got A LOT of questions from your fans, but of course I couldn’t use them all. I had to go with the most frequently asked questions and the most interesting, so let’s get to it! Hmmmm....I think, my first kiss was Jessi Chandler. Haha! Out in the school parking lot in 6th grade. So funny! Yes I have! I think its the best thing to experience too. You really get to see how inspired people are by you and that’s really uplifting. I think that with hard work and a good mind set, I have a good chance of doing something with music. If I could go everyday for the rest of my life, not being famous and just make at least 3 people happy with my music, that would be okay with me. Don't listen. There is always going to be someone that doesn't agree with what your doing or how your doing it. I do what I love and what my fans love. “Whip your hair“ as Willow Smith says. Haha. I think it would be “All of the Lights” Kanye, Rihanna and Cudi. And last but not least, we have somebody who shares my name lol! Ari K. asked, “Is it weird for you to suddenly have all these fans and girls in love with you?" And there you have it folks! Dylan, it’s been a pleasure! Thank you so much for hanging out! I’d like to give a special shoutout to Hannah Stankus and Cassidy Ohrt who are probably your biggest fans! Lol Thanks ladies! 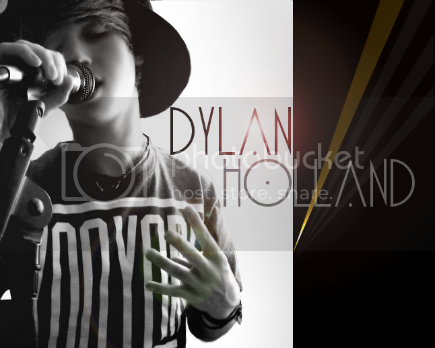 Everybody make sure you follow Dylan on Twitter, and “Like” his Fan Page on Facebook! Check out a Dylan's original song "Kiss Me". Dylan's gonna make it you guys, no doubt :) He has a good heart and is one of the most talented people I've ever seen, and I'm supporting him every step of the way. Deezy lovee<3 -Dusti! @dustibabyy ; @deezyyswag!! I listened to Dylan's cover on Justin Biebers' "Pray," and a snippet of Dylan's new song as well, he did a wonderful job! You go Kid!!! I LOVE YOU DYLANJOSEPHHOLLAND<3. you are amazing and need to become famous alreaddy!